WHALECOME! This website is ALL ABOUT BLUE GROWTH. Our Foundation is dedicated to assisting individuals and governments who care about and wish to grow their blue economy for a sustainable future world where there could be food security and clean energy abundance for all regardless of geographical or political boundaries. We are a totally independent think tank, helping only by sharing ideas and information. The starting point is that we know more about the Moon than our oceans - we have just skimmed the surface in the struggle to come to terms with global warming, plastic pollution and food security. WILDLIFE IN TROUBLE - We took over the SeaVax project from Bluebird Marine to add to our other projects to help combat plastic in our oceans. We are not supported by any Government or Non-Governmental initiatives, grants or other contributions such as the G7 Challenge or Horizon 2020 calls for proposals, mainly because we know from previous H2020 applications that these calls and challenges would most likely preclude us, or are so expensive to apply for that we could not afford to take the chance and waste our limited resources in applying. We are thus working on crowd funding stages that we will release in advance of any previous call for project funding being near to completion. As and when we succeed with the targets that we set ourselves, it will not be because of any politician that you have voted for, it will be because you decided to cut out the middle man and contribute to our work directly. Please only give what you can afford, just as our volunteers only work as and when they can. 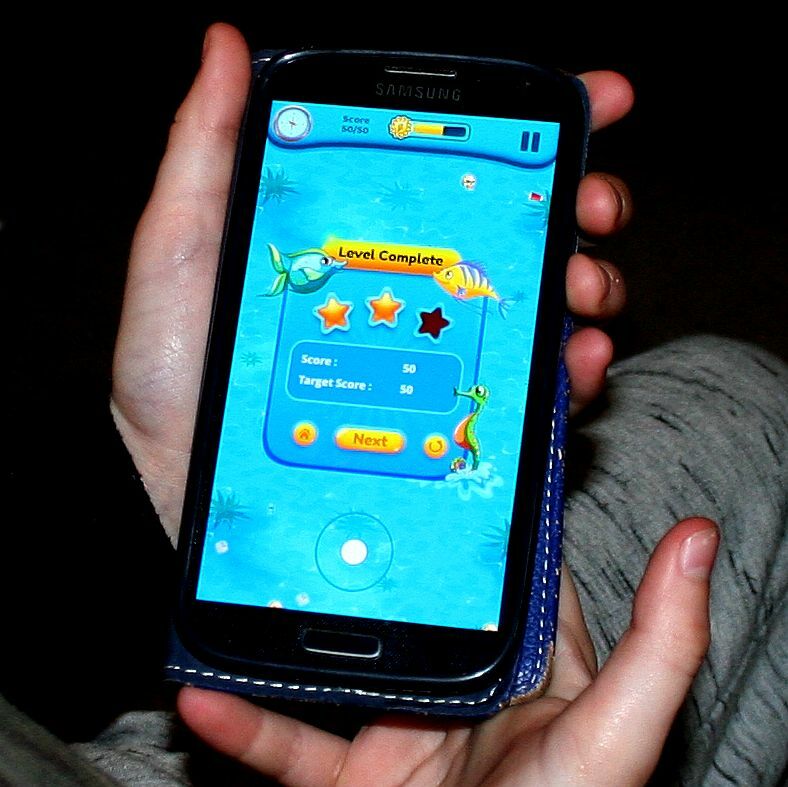 OUR FIRST CROWDFUNDING CALL GOES LIVE END OF APRIL 2019 - Children love playing games on smartphones. 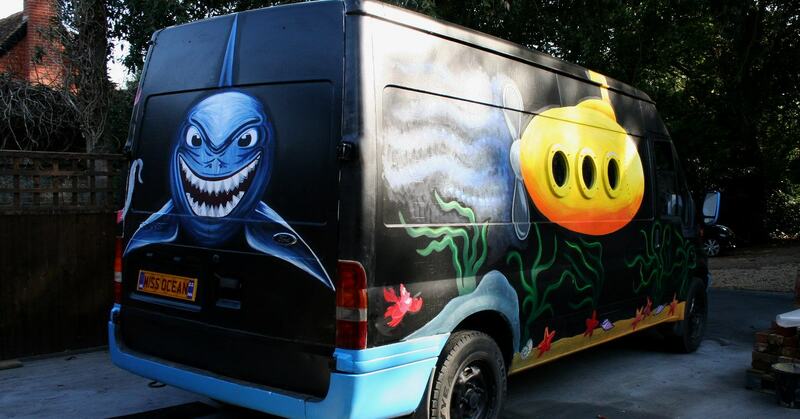 What better way to help the next generation learn about ocean pollution than to let them clean the oceans of marine litter with a solar powered vacuum ship. We live in a society where cleaning up our mess is an afterthought rather than an integrated element of a plan before we do something. That is why we have ocean pollution and global warming. If there had been a plan before we started using plastic, or burning fossil fuels like there was no tomorrow, we'd have known what we were doing and how to avoid the mess we are in right now. We should have worked on containing our waste and limiting fossil fuel use from day one, as a precondition to such use as responsible custodians of planet earth. We didn't. What are we doing about it? Good question. Not as much as we'd like, but our hands are tied with the current UK funding rules not favoring charitable research, and Brexit leaving us in limbo as to potential EU funding. Development is not possible without the money to pay for specialist engineering and buy materials and parts, no matter how enthusiastic our trustees and volunteers. Not to be downhearted, we set out sights a little lower until the powers that be find a way to help us out, or maybe talking businesses or other academics into shadowing our research. It matters not to us how ocean cleaning is achieved, so long as it is achieved. In 2019 we are fitting an energy harvesting test rig to our Ford Transit support vehicle. FORD TRANSIT TEST RIG - For 2019, we are building this wind turbine and solar panel test rig. The solar wings can track the sun and fold over for safe storage when weather conditions are unfavourable. This operation is independent of the wind turbine mast, except that the wind turbines are designed not to operate to shade the solar panels. If this arrangement works it will allow zero carbon operation of workboats - and maybe even one day for cargo vessels and cruise liners. We hope to be able to mount the rig on a 12 meter floating platform in 2020, subject to funding. Funding is the single biggest problem for us where not for profit organizations do not fit the mould to qualify for support from the British or European Governments at present, and as for Brexit! Copyright © diagram, March 5 2019. All rights reserved, Cleaner Ocean Foundation Ltd. If all goes well in 2019, we should be in a position to build a low budget, 12 meter, coastal and river sweeper. This will give our volunteer engineers some practical hands on experience for when (if) funding might become available for SeaVax. It's worth bearing in mind that even this quarter scale workboat is to be climate friendly. If the plastic bag tax from supermarkets were to be diverted to this kind of research, we'd be funded overnight. Sadly, the 5p charge goes to all kinds of other good causes : ( We cannot complain about that, but wonder how it was that where the money raised goes was not part of the agenda when forcing the collection of what amounts to an environmental tax. A missed opportunity perhaps! EXPERIMENTAL COASTAL CLEANER - Where we are unlikely to attain funding for SeaVax in the current financial climate, and despite the G20 agreeing to work together to tackle ocean plastic waste on land and the G7 looking to extend such ethos in principle though lacking in detail, we have set our sights a little lower with this coastal and river cleaner and water sampler, that, with a fair wind and success in 2019 with the Ford Transit energy harvesting test rig, we might raise funding locally for 2020. We'd need in the region of £120-150,000 thousand pounds for this budget custom built workboat. An environmental bargain if ever there was one. Copyright © diagrams, February and March 2019. All rights reserved, Cleaner Ocean Foundation Ltd.
MARCH 2019 CALL TO ARMS - They are school kids temporarily sacrificing their education in order to save our futures from dangerous climate change. What stars. On November 30, over 15,000 boys and girls went on strike from school in every capital city and over 20 regional centres across Australia. On March 15, they are going even bigger and inviting adults to join them in solidarity for a Global Climate Strike. We're in! 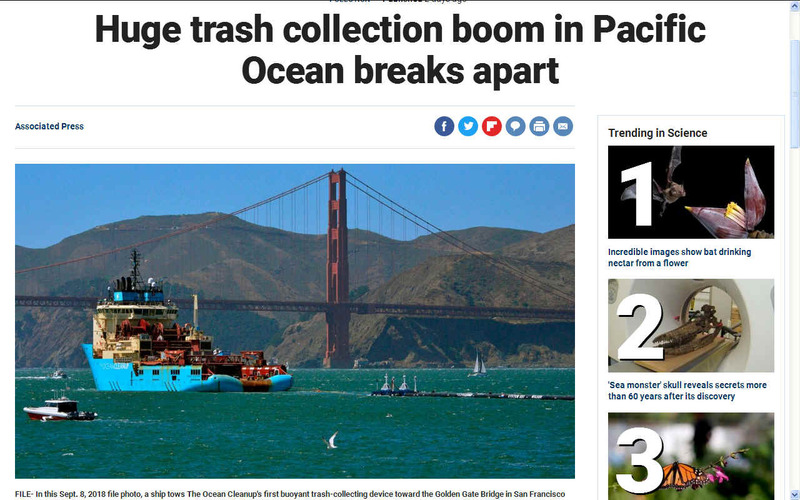 FOX NEWS 6 JANUARY 2019 - A trash collection device deployed to net plastic litter floating in the Pacific Ocean between California and Hawaii has broken apart and will be hauled back to dry land for repairs. If Boyan Slat and his engineers can get the boom system to work, the Cleaner Ocean Foundation might not need to press ahead with SeaVax. We'd only need a RiverVax perhaps - but the limited demand for zero carbon river cleaners may not make it worth the development time if ocean plastic is being collected. It's a hold your breath and hedge your bets moment that's for sure. Should SeaVax not be needed, we might concentrate our limited resources on testing zero carbon hulls for a future fleet of clean cargo ships to reduce climate change, and in turn, acid oceans. We wish the Ocean Cleanup Project the best of luck with their next series of trials, hopefully without too many delays before redeployment, because we cannot hold our breath indefinitely. Meantime, we are looking at ways of raising funding, given that we are a charity. Charities do not qualify for most of the calls of the Dti, where proposals for this kind of funding must be led by a trading company - with a plan to make money. Ocean cleaning is more a social endeavour, not understood by bankers and politicians who are all about profits for shareholders. Good causes do not get a look in, even if our politicians and bankers who support dirty corporations, are responsible for the mess in our oceans. Fortunately, there are a growing number of responsible international companies, that may at some time tip the balance in favour of not for profit research. “Plastic Free Eastbourne” a free to attend event at the Enterprise Centre, Eastbourne (near station) Saturday January 26 2019. 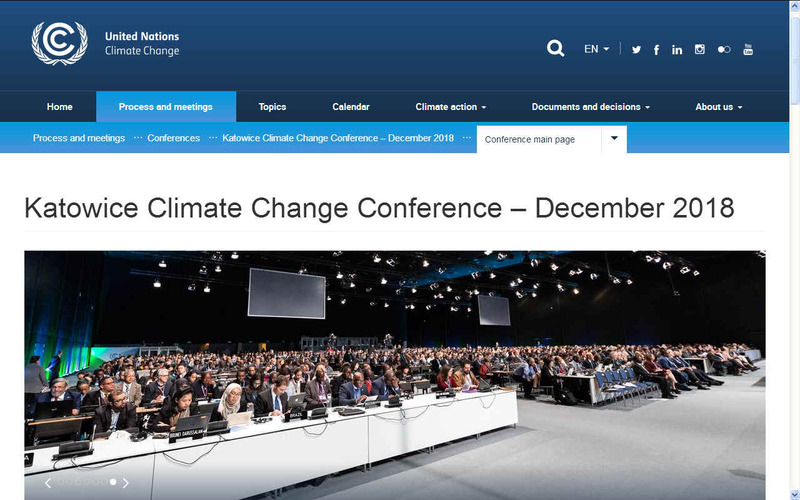 COP 24 - The UN climate summits are known as COP = Conference Of the Parties. During these global discussions, action for climate policy is negotiated. In December 2018 the climate summit will take place in Katowice due to their high conferencing standards. Before the event started, 50 high profile companies published an open letter to the UN calling for more action to curb climate change. 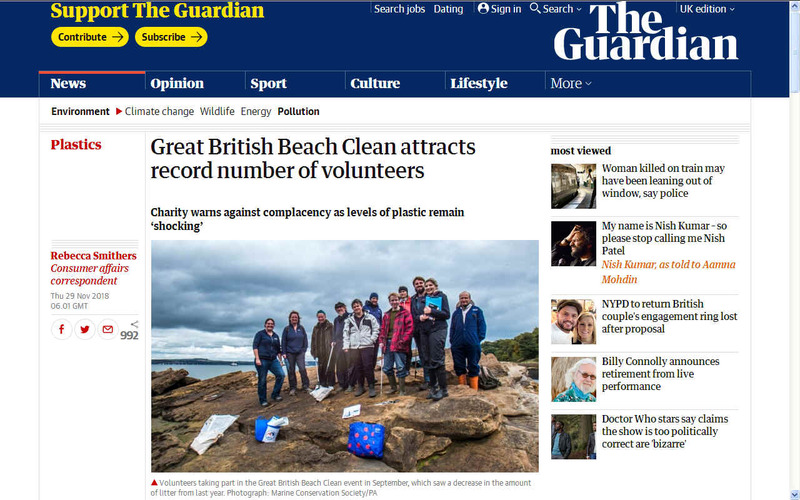 OCT/NOV 2018 - The European Parliament voted to ban single use plastics and in England, record numbers of volunteers turned out to clean the beaches against warnings of shocking levels of plastic. 'Blue Growth' success, like any tall structure, depends on solid foundations. At the moment the ecological foundations of our oceans are crumbling from man-made pollution, to include plastic, chemical spills and acidification. The tragedy that was Deepwater Horizon is just one of a long list of examples of what poor management, focused only on short term profits will achieve. Many countries have been treating our oceans like one giant garbage dump and some still are because they may not appreciate the enormity of the clean up challenge. We simply must shun such anti-social behaviour. We need to start thinking long-term with an emphasis on "planning" for a sustainable future rather than reacting to problems as they crop up and trying to fix our foul ups retrospectively. We also need to learn how to walk before we can run. We are the only organization developing a system that removes micro plastics without harming marine organisms. We are also experimenting with zero carbon hulls that could pave the way for pollution free shipping of the future. SWING SPONSONS - In the quest for cleaner shipping, we are constructing this test tank model of an advanced solar boat concept. This is one of the outriggers that move to compensate for increases or reduction in displacement of the cutting edge hull designed to be super efficient for long endurances and high speed ocean crossings. These sponsons can also be used to capture wave energy for propulsion for the Elizabeth Swann solar powered boat. FACILITIES - Our test tank took another leap forward with the fabrication of the powered lifting and lowering mechanism for the carriage that takes the SeaVax proof of concept model out into the middle of the water basin. Chris Close inspects his efforts after lifting the rather heavy assembly into position. Two men just about coped with a lot of grunting. Copyright © photograph July 15 2018. All rights reserved. You will need the permission of the Cleaner Ocean Foundation to reproduce this picture except for educational use in school and colleges or for private research. GAME CHANGER - The SeaVax ocean plastic cleaning vessel is seen here carried by an AmphiMax beach launcher, to form a go anywhere ocean cleaning rig. 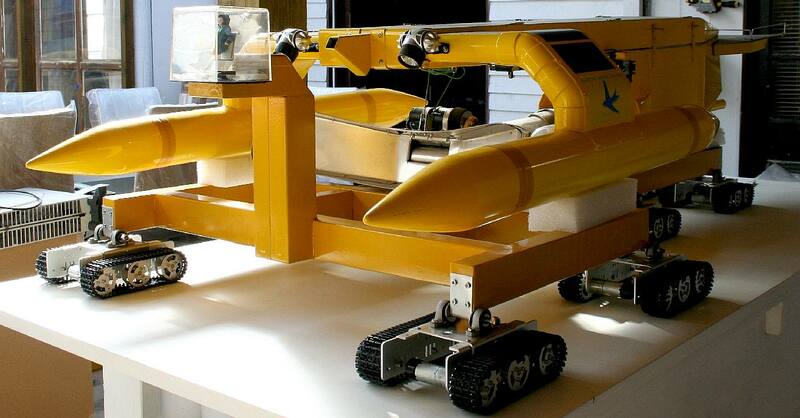 In our quest to clean the oceans we need to prove the concept using these scale model robots - before we move on to any full size versions, aiming for mass production, local to the plastic hot spots - all around the world. UNIQUE - We are the only research organization developing a system that will be capable of removing micro plastics from the open ocean on a large scale without harming marine biota. How does SeaVax do that ? Help us to complete this research if you can with any size donation. Copyright © photograph 25 June 2018 Cleaner Ocean Foundation. All rights reserved. ROBOT LAB - Straight back to work from a terrific maritime event in Bulgaria, our volunteers re-assembled the AmphiMax with these rugged swivel axles for water tank and other vehicle trials later this year. This unique shore based vehicle is designed to launch and recover SeaVax. The AmphiMax can handle an all up weight of around 100 tons. The Foundation hope to test a half size version of the real thing in 2019-2020, or as soon as funds allow. Copyright © photograph 23 June 2018 Cleaner Ocean Foundation. All rights reserved. 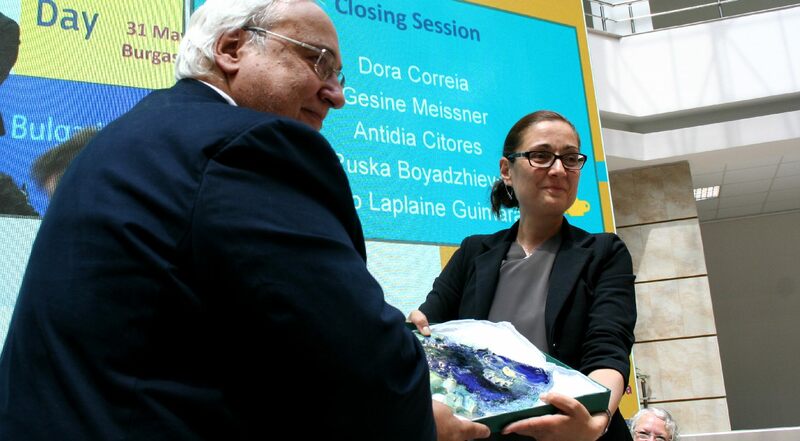 EMD MAY 2018 - To close this year's sessions, the European Maritime Day mantle is handed over from the Mayor of Burgas to the Mayor of Lisbon with presentations from both parties. As a result of their EMD Burgas has committed to take action to conserve the Black Sea and promote blue growth. Copyright © photograph 1 June 2018 Cleaner Ocean Foundation. All rights reserved. 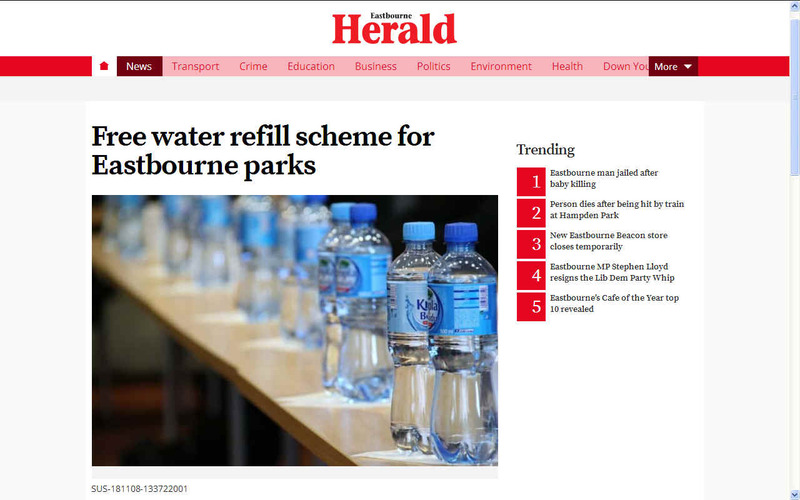 One area that everyone can help with is to say NO to single use plastic for the packaging and selling of foods. Another way you can help to reduce airborne pollution is to drive an electric car. That way noxious gases that cause acid rain could be reduced in the switch to clean, renewable energy. You can also lobby your local officials and members of your Government to adopt more sustainable policies. Most informed world leaders appreciate the problems we are facing, but need your support and any helpful suggestions as to change to get things done. 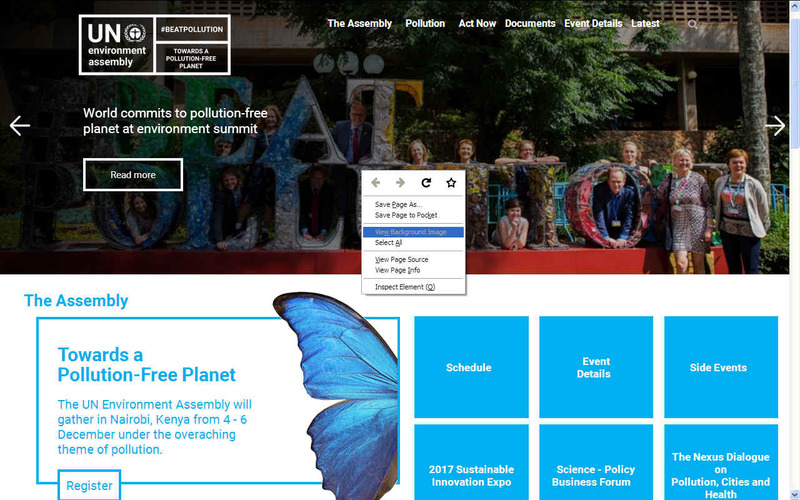 UNEA3 - The third meeting of the UN Environment Assembly was held on an exceptional basis, from 4-6 December 2017, with the high-level segment taking place on 5-6 December, and the Open Ended Committee of Permanent Representatives (OECPR) from 29 November to 1 December in Nairobi, Kenya. It was agreed that marine litter should be prioritized. Read more on this event by clicking on the picture above. BRUSSELS 9 NOV 2017 MARINE LITTER LATEST: Claus Schultze from the DG MARE maritime innovation and marine knowledge & investment section of the European Union is seen here giving a passionate talk on marine litter to a packed house of some 247 delegates. This EMFF call was a pilot action where it was up to the stakeholders represented by those in the audience, to provide feedback. In this speech it was acknowledged that desperately needed innovation "can only happen if we invest." The EU was taking this action in the hope of bridging the "financing gap," what Mr Schultze described as the "valley of death." The focus was on drivers and innovation. We could not agree with the speaker more and thank the EMFF for putting marine litter on their agenda. Our man in Brussels asked the question about Brexit and how that might affect any UK involvement as to project proposals. The answer confirmed our worst fears, in that we are unlikely to gain funding from the EU, save only if the G20 roll up their sleeves after Hamburg and evidence their paper commitment. BUSINESS ONLY POLICIES - One major blocker to social innovation is that not all enterprise is about making money. Some projects are about improving air quality or ocean health with no thought of making money from such endeavour. Traditional research establishments and academics are funded for pure research and monitoring of the natural environment, but projects that are somewhere in between are generally not catered for in the world of international finance such as United Nations projects, European Union initiatives or UK Government programmes. This leaves projects like SeaVax looking for other ways of raising operating funds - such as crowd funding and philanthropic donations - that are generally only very rare occurrences and for sure require an act of faith, where time is marching. 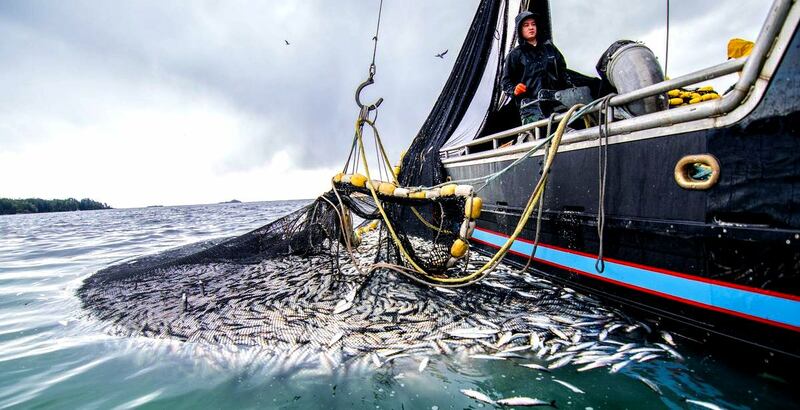 ALL FISHED OUT - A recent United Nations study reported that more than two-thirds of the world's fisheries have collapsed or are currently being over fished. Much of the remaining one third is in a state of decline due to habitat degradation from pollution and climate change. Escalating amounts of point and non-point pollution continue to threaten water quality and fish habitat. Yet, the human population consumes over 100 million metric tons of fish annually and more than 25% of the world’s dietary protein is provided by fish. 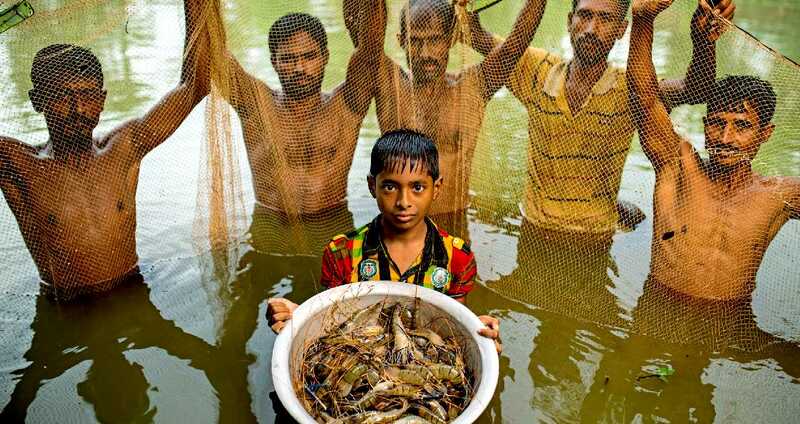 DWINDLING FISH STOCKS - Food security is a major problem the world will have to face as the available land for to grow crops reduces in competition with land for housing, as the population expands. The situation is far from sustainable and a bubble that will burst. When the bubble bursts it will cause the deaths of millions of people, where additional farming will create more carbon dioxide to heat the climate, making more land barren in a vicious circle that we must take steps to prevent happening. Around 10% of the world (700,000,000 million people) rely on the ocean for food, but in addition to our poor land management record, we are also polluting the seven seas with plastic that is toxic - so reducing the number of fish that we might harvest for food. Aquaculture, is seen as the savior for fish supply, but fish farming is dependent on ocean and land derived feeds, hence is more of an icing quick fix than a really tasty cake. ABOUT OUR BLUE GROWTH A-Z - We are just one of literally hundreds of concerns doing their best to promote Blue Growth around the world, with the Circular Economy firmly embedded as the driver. There are so many organizations involved in this worthy cause that it is sometimes difficult to see at a glance where the initiatives are in place and where more attention is needed. That is why we thought it helpful to have an A to Z index of the projects that are taking place, planned for the future, or have taken place as examples of progress. It is also helpful to us to know who our potential international partners are. We only started compiling our Index in May of 2017, but we hope that by this time next year to have a comprehensive listing of contributors to blue growth and the current state of the art. A VAST RESOURCE - The ocean is a vast underutilized resource in terms of energy generation now over fished to to the point of stagnation to feed a growing world population as land is being absorbed to build on for housing and factories, so reducing agricultural potential. In short, we are exhausting our natural resources in order of ease - for maximum profits - a short term strategy. It is easier for us to take all the fish and minerals we can in the short term and fill the ocean with waste and not worry about the consequences today. But what about tomorrow? 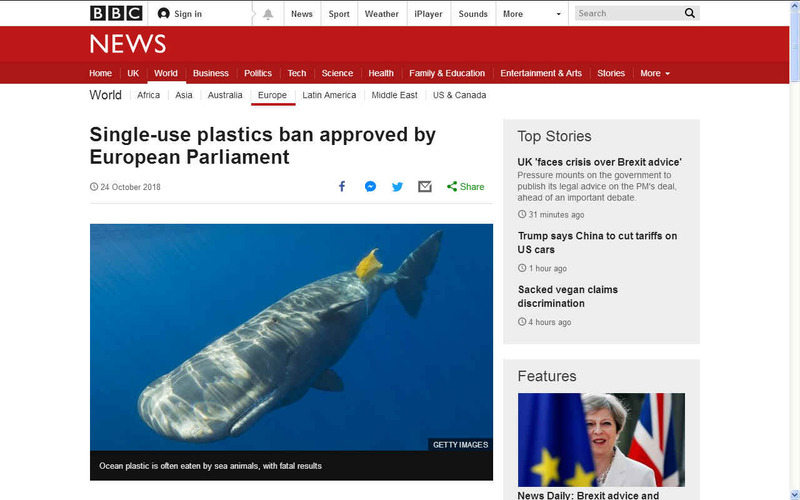 The use of single use plastic for packaging is just one horrifying example of major stakeholders using the most convenient means to get their product to market, while ocean literate policy makers watch marine life suffer as they grapple with ways to juggle economics and morals, praying for a miracle as they work out their terms of office. OCEAN CONDITIONER - This vessel is designed to operate in fleets to target sea-borne waste before it settles on the ocean floor where nobody can recover it. There is nothing like it in existence today, though thankfully, other ideas for trapping plastic waste are being developed in tandem, such as that of Boyan Slat and the Seabin. 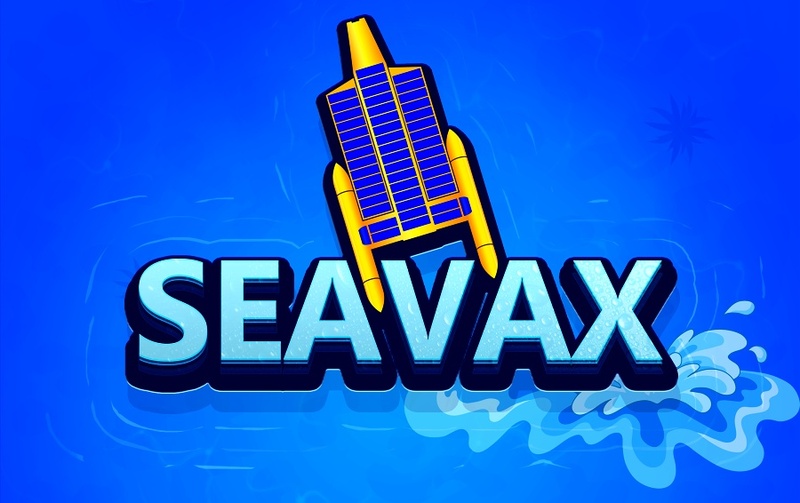 We hope to be able to continue with our research and development of SeaVax so that if we are unable to manufacture them ourselves that third party operators may do so with the support of continued R&D and other technical backup. To this end we are continuing to improve our facilities for the next round of experiments through 2018. OCEAN CLEANUP GAME: The "SeaVax" game starts and you have to decide which ocean to clean up first. You see plastic trickling into the oceans as marine litter and you must clean up each ocean as you race to complete the levels from one ocean to another. If you play the game cleverly you are able to manage plastic flow into the oceans. If you don't fish for plastic very well - the oceans get choked with plastic and the world population slowly dies from starvation. Sadly, this is actually happening in the real world. 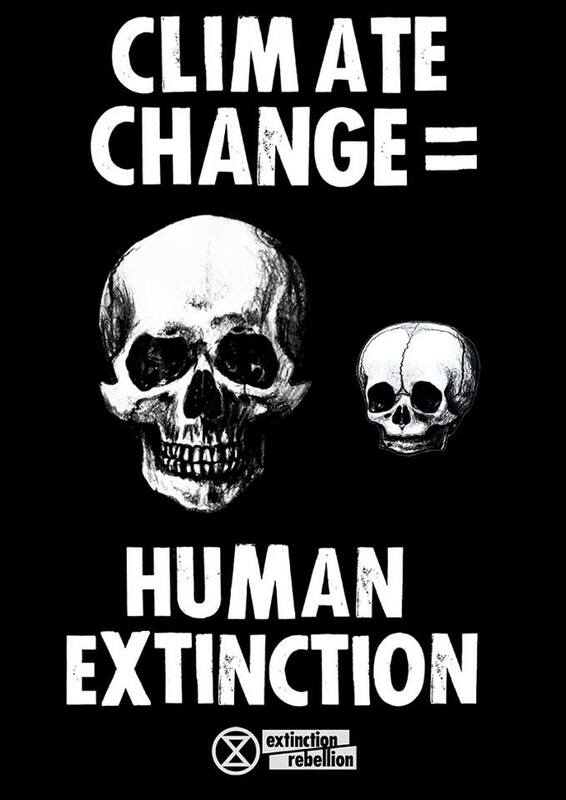 But as an eco-warrior you can help stop that from becoming the fate of millions of people. This game is under development as of January 2018. If you like the game we may extend the concept into a powerful 3D Virtual Reality experience. SYMPOSIUM HASTINGS - Three of our volunteer crew were at this event in Hastings thanks to the sterling efforts of Gonzalo Alvarez, Sarah Ward and other members of the Bexhill branch of the UK United Nations Association. The youngest team member was Ryan Dusart, 10, who helped to man the stand in the Crypt, and explain how SeaVax works to visitors. 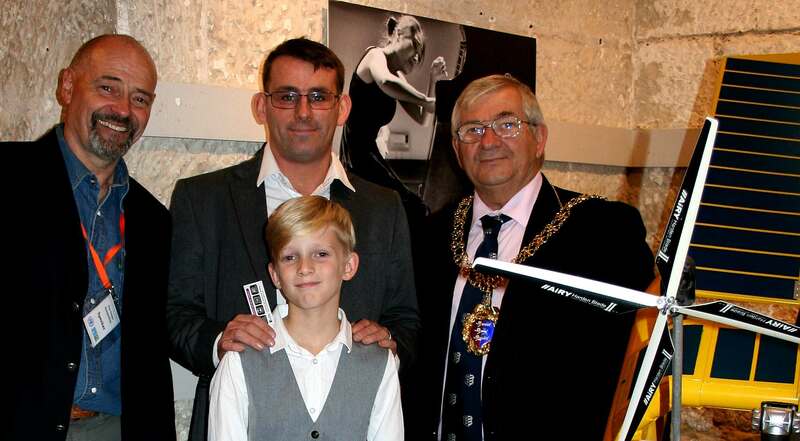 The Mayor of Hastings, Councillor Nigel Sinden, is seen here before he welcomed delegates and declared the event open. Copyright © photograph September 22 2018. All rights reserved. You will need the permission of the Cleaner Ocean Foundation to reproduce this picture except for educational use in school and colleges or for private research. SEAVAX - For our part, we will be doing all we can to bring to the table a blue water prototype of this ocean cleaning vessel - where waste and the health of the seven seas appear to us to be a high priority to counter wild fish catch stagnation - that clearly requires ocean regeneration. The Cleaner Oceans Foundation will be publishing news articles on this website in the hope of stimulating research today for a brighter blue economy tomorrow. Please note that progress on this project is funding dependent. At the moment the planned build stages of this versatile platform cannot proceed until sufficient backing is obtained. We are an independent not for profit organization reliant on voluntary donations to progress this important work, we are not supported by any government fund or other governmental group or organization. SPONSORS: This website is sponsored by the Cleaner Ocean Foundation, Bluebird Marine Systems (who were funded by Avaaz in 2016) and many other contributors too many to mention here. Collectively, our supporters are dedicated to growing the blue economy for the good of mankind and for our children who will inherit what we leave behind. BLOCKER - The opposite of blue growth and something that is a serious menace is the accumulating mountain of toxic plastic under the sea where we cannot see it. The only evidence of this for landlubbers is coastal pollution on our shores that we only see on holiday and in the occasional media article and soon forget as we return to our office desks and factories. In the main these are single use plastics made for our short term convenience - without regard to the long term consequences.